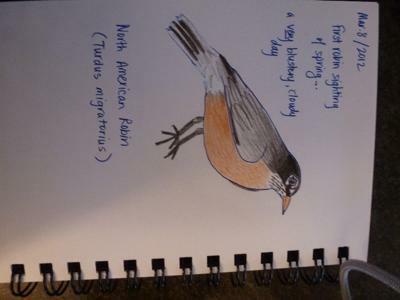 First Turdus Migratorius of the season! My son and I noticed our first American robin of the spring season on our walk home today. It is a very blustery, cloudy day. We each sketched a picture of the handsome guy. I was happy to find out the Latin name of him... thanks! Thank you for sending this to us, my apologies for not posting it sooner!